Dentures are prosthetic devices used to replace missing teeth and are a popular choice for partial or full dental replacement. Downtown Dental offers a variety of Denture options to help best fit you and your unique needs. We offer both Complete and Removable Partial Dentures (RPD) depending on a client’s dental needs. With complete dentures, all of the natural teeth on top or bottom are removed and replaced. Impressions are taken to get a custom fit to gum tissue. Teeth can be chosen in many shapes and shades, and we will help select teeth that are the best fit for you. 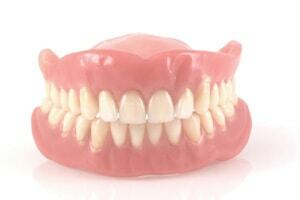 For added retention, complete dentures can be supported or attached with dental implants. This is particularly beneficial in the lower jaw. RPDs are used when some natural teeth remain in the mouth. An RPD hooks onto the remaining teeth for retention with clasps. The clasps used are typically metal, but in some cases, we may choose gum or tooth colored clasps. For those who want a very esthetic result with no clasps showing, we can also discuss special crowns that can be placed on the natural teeth to which the RPD then attaches. At Downtown Dental in Charlottesville, we can help protect your teeth and decrease the pain and issues caused by grinding teeth. Talk to us about custom occlusal guards and mouthguards today!